1. Ultimate Windows Tweaker: An Ultimate tool to tweak or change hidden Windows Settings. It consists of 200+ settings and comes in size of less than 1 MB. Version 3 supports Windows 8. Version 4 supports Windows 10. Featured in various International magazines. 2. FixWin: FixWin is an essential tool in case of Windows causing problems. It is packed with 50 common fixes which allows you to fix most Windows problems with one click. Version 2 supports Window 8. Version 10 supports Windows 10. 3. Web Pinner: Web Pinner is a freeware app that can add website links to your Windows desktop’s right-click context menu, quickly and easily. Support Windows 7 and higher. 4. Pulmon: Pulmon is an attempt to replace desktop icons with some beautiful and useful tiles. There are many tiles to add to the desktop including Clock, Internet Explorer etc. Pulmon is inspired by Modern UI of Windows 8/10. 5. 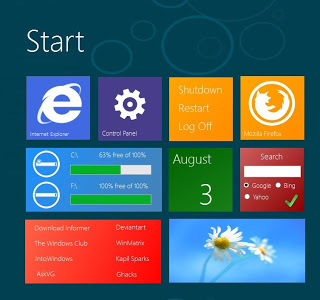 Tile Locker: Prevent anyone from modifying or removing tiles in Windows 8/10 with one click. 6. Desktop Icons Spacing Controller: Why have same and boring space between desktop icons when you can change it? This tool can change the horizontal and vertical spacing between the icons. Featured In German Magazine PC-WELT. 7. 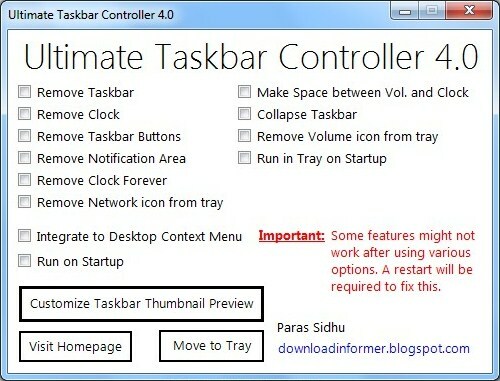 Ultimate Taskbar Controller: Get more control over Windows Taskbar. Customize various icons, thumbnail preview etc. 9. Disguise Folders: Want to hide any folder from others? Disguise it. Use this simple tool and convert any folder into system utilities like Recycle Bin, System Restore. When you want to access its contents, simply undisguise it.